Before we get started in the heavy material, I want to acknowledge how this surah sets a better standard for the Quran’s capacity to answer criticism. The low standard of dialogue set in The Cattle (in which Muhammad’s commanded response to all the challenges of the unbelievers was to call them liars, marked by God for Hell, and to feel vindication in thoughts of their torment) still haunts my mind. A better standard was set in The Bees which, while it rarely had a complete answer for or representation of the unbelievers’ challenges, was at least less spiteful. Today’s surah lists a few objections and gives some good, even poetic, answers to them. The unbelievers challenge Muhammad as to how they will be resurrected from bone dust (ayat 49-52). The Quran responds by eloquently ridiculing their quibbles on the point. God is all-powerful. He created mankind from particles before and can easily recreate man again, out of whatever material He wants. Science is not a limit to His power, and it doesn’t matter what kind of substance is being resurrected, He can do it. This is a direct answer to their challenge, and I agree that it’s a valid one if you believe in a God who can supersede science. The unbelievers ask when will this happen, and the Quran commits to no set time. It’s only comment is to say that at the resurrection, their current perspectives will become obsolete. The Quran again comments upon the irony in the pagan Arabs’ misogyny. They prefer male children, but they worship a God who they believe took for himself no less than three daughters. Why do they hate daughters if such were good enough for God? Or why don’t they believe that God would instead take for Himself sons since they regard sons as favor from God? The ideas don’t line up. Now, these daughters were probably Al-‘Uzza, Allat (literally “the Goddess”), and Menat. This artist, while hardly an authoritative source, gives a nice clean summary of these goddesses. You can also look up the names within this list of Arabian deities to get fuller description. (Though the author does not cite sources with the article, an impressive bibliography is attached for further research.) Looking at the length of that list leads to the next irony Muhammad picks at, which is that the pagans have other smaller gods despite The God being far superior in class and ability. Ayah 42 mocks that even if those gods did exist, they would be relatively on the same ground as humans in their need to seek and strive for God. The God is just on a different scale than mere local or thematic deities. Muhammad’s contentions with the pagans are decent stabs at the content of their culture and its need for some reform. 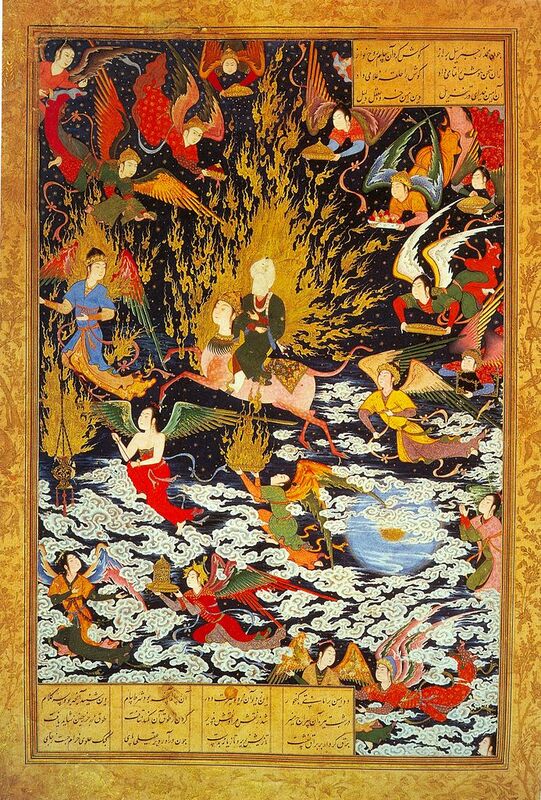 The many miracles that the unbelievers demand to see from Muhammad before they are willing to believe in him are listed out in ayat 89-95 to comical effect: bring springs and gardens out of the dessert, ascend to heaven and bring back a physical copy of a Holy Book for them to feel and read, shatter the sky, live in a house of gold, bring God and His Angels into view. Muhammad’s response to these demands is apropos, “Can’t you see I’m just a human?” While this response does miss the point that Muhammad is operating on behalf of an all-powerful God without any signs of support from an all-powerful God, it is a good answer in that it highlights that Muhammad is not claiming any superpowers for himself. He can’t perform miracles because he’s just a man, and the Quran laments at their hangup over this idea. At first I was confused by ayah 95 because I thought the pronoun “them” meant the unbelievers, but after a bit of sitting with it I realized that “them” meant the hypothetical community of angels. In essence, the situation is that God sends like to like: if the community needing reform had been angelic, God would have sent an angel. But to mankind he sends men. This doesn’t answer why God works that way, but it does reinforce the Quran’s view of God’s prophetic method. This tafsir argues that God operates in such a way because the life of the prophet must be relevant to his audience to in order to have meaningful influence. The life and habits of an angel would not correlate to the life and habits of a human, delivering only half the guidance needed. The tafsir’s conclusion is that a model for holy living is essential to completing guidance, which paves the way for revering Muhammad as much as the Quran. Some Muslims present that the purpose of the Quran is to define mankind’s relationship with God, then mankind’s relationship with each other. I think this surah functions well in setting up these relationships. Last week, I quickly surveyed the values and morals put forward which dictate how men are to treat each other and administer justice amongst each other. Something that I didn’t highlight back then was that commandments for human-to-human treatment were given alongside human-to-God commandments. Sometimes this was almost comical in effect, as in ayah 23, “AND YOUR LORD HAS DECREED THAT YOU NOT WORSHIP EXCEPT HIM, and to parents, good treatment…” Naturally, that all-caps is mine, but there’s such a magnitude of severity between the two crimes that I can’t help but hear in my head a difference in volume. This is not to say such contrast is a flaw. The magnitude of the first command serves to emphasize the significance of the latter, and also implies that one’s relationship with God relates to one’s relationship with men. “THERE IS ONE GOD, and He wants you to treat your parents well.” It’s details like these that help flesh out what is supposed to be the Quran’s main themes: who God is, who man is, what this implies for man. Who God is has been often given in the form of equational phrases, “He is the Hearing, the Seeing,” like what appears in the first ayah. There is a difference between being told something, and being shown something however. Much of the Quran vividly shows God being wrathful, which has left a strong impression that God’s identity is all about justice to the point of spite. While there are lots of places where God is directly described as ever merciful and loving, it is only an attribute that shows up on condition that one turns to Him. Though His mercy to unbelievers is, in a way, demonstrated to the unbelievers by allowing them some time of comfort and pleasure in this life, that portrayal has been compromised by examples of God playing cat-and-mouse games with the unbelievers so that their destruction will be all the more horrible for surprising them when they feel the most secure. Today in ayah 20 there is mention that God provides for both the believer and the unbeliever. There’s an implication here that God is generous without condition because that is just who He is, and we have been shown examples of this in today’s surah and very thoroughly so in suwar like an-Nahl which examine God’s provision throughout creation. The Ever Generous nature of God is probably the most unconditional trait we have seen demonstrated in the Quran. Mankind’s response to this generosity is supposed to be gratitude and praise. In ayah 27, wastefulness is equated to being brother with the devils, whose existence is defined by ingratitude. Everything in the Heavens and the Earth automatically gives praise to God, ayah 44 declares, and we can remember back in an-Nahl 48 it was said that even mankind’s own shadows prostrate to God. Mankind and jinn seem to be alone in the category of those without natural gratitude. Something interesting is that this ingratitude is portrayed as mankind’s default state. Remember in al-Baqarah that the angels first resisted bowing to Adam because they perceived he would be destructive in contrast to their natural praise and gratitude. God made them bow not by proving they were wrong, but by asserting His authority. This preference for a being who is capable of evil but who chooses good might show that God values human free-will, an idea in common with Jewish and Christian theology. This surah emphasizes that God is looking for human intent and deliberateness in their actions. The hiccup in this is that the Quran doesn’t consistently portray humankind as having free will. While we’ve had trace evidence of the idea in ar-Ra’d 11, in which God’s will is said to only enforce the direction of man’s will, you cannot deny that the Quran portrays that at some point God closes all opportunities and even corners men into damnation. We’ll get into that in a second. This surah has a few specific statements about the Quran. It says the choice to reveal the Quran in accumulative chunks over a period of time is deliberate, and that its contents are diverse and manifold in order to convince and appeal. It also proclaims itself as unique and inimitable, unable to be replicated by the efforts of man or jinn combined. By self description it states that its purpose is to bring good news, mercy, and wholesome guidance to the believers. My summary of these self-descriptions is that the Quran views itself as promoting only good things in the most undeniably beautiful and articulate way, and that if you trust in it you will have access to that beauty, wholesomeness, and reward. Not far underneath this description I read the subtext that questions what kind of person you must be to reject the Quran, because the Quran also presents itself as a test of character. The surah describes that the proper response of the believers is to fall on their face in tears praising God with ever increasing humility. Unbelievers, by contrast, are said to only increase in disbelief when they hear the Quran, and they turn away in aversion. Ayat 45-46 describe God as separating the unbelievers from the believers, covering the unbelievers’ hearts and making them deaf so that they cannot comprehend the Quran. This act is puzzling because it involves God interfering in the free will of humans to respond to His own message. If people are divinely inhibited from accessing the Quran, how are they supposed to make the decision to save themselves? Is the Quran here to convince us of its beliefs, or is it on the other side of a line in the sand that you must cross before it means anything to you? The thing that I see in this passage is that accepting Muhammad’s words is paralleled to the test of the “accursed tree,” which we assume to mean the forbidden tree in Eden. This makes belief in the event a test of loyalty and commitment, which given the nature of the sign one would argue that such is all it could be. The Night Journey was not a sign for the people, it was not a shared experience. It was a sign for Muhammad, one which he could present with a “take it or leave it” addendum. My gripe with the parallel to the “accursed tree” is that in Eden trust in God was the default, with the tree being the sort of “opt out” button. Taking Muhammad’s word at face value is not the default here, it is the deliberate choice one has to make to “opt in.” This parallel implies that Muhammad’s words are so obvious a choice that it takes a deliberate act of rebellion to reject them. The Quran follows up the test with wa-nu-khawwifu-hum, literally “and we cause fear to them.” Though the Quran knows that people will respond badly to threats, it leans in to that downward cycle. Denunciations of the unbelievers’ character are scattered throughout the surah. There is never any hint that they might respect or already practice some of the virtues that Muhammad is teaching. Some of these denunciations seem to be specific to Muhammad’s situation. Ayat 73-76 describe the unbelievers as trying to change Muhammad’s message, and then trying to evict him, and the surah warns that such an eviction will summon in the unbelievers’ doom. That is clearly a reference to Mecca. So does it follow in Muslim minds that the passages about how people respond to the Quran are not universal? Do examples of the past stay locked in the past, or does their precedence extend to apply to the future? This question is ever more relevant to me. In frankness, I am not finding any self-evident divine inspiration in the Quran, and am growing more disturbed with each surah as I go forward. When I opened the book I’d hoped to find more of those spiritually forming relationships –who God is, who mankind is– and how to live with those relationships established. I had expected it to include some consequences for rejection –my own religion has such too– and I was ready to compare the systems of justice, mercy, and spirituality to see if one commented on the theological struggles of the other. But what I’ve been finding more and more is the Quran is trying to sort people into two categories: with Muhammad or against Muhammad. Muhammad’s teachings are not always unpleasant, but they do spend a lot of time dehumanizing his opponents. There is no nuance in who is against Muhammad, no acknowledgement of righteousness or fair intention in the other side. Even in this surah, the only goal of the unbelievers is to sway Muhammad (putting him in danger of receiving two-fold damnation) and if they cannot sway him they will only strive against him. Even if this is only supposed to represent the situation in Mecca, why is there no mention of the live-and-let-live Meccans like Muhammad’s own unbelieving benefactor Abu Talib? As I find myself growing more and more averse to the Quran, I worry what it tells its adherents to believe about me. Am I being blinded and sealed for damnation by God? Is my reading the Quran only worsening my damnation? Do I only exist to tempt them into sharing my damnation or to strive against them? The severity to which I’ve started feeling this aversion does not derive from this surah in itself. In truth, today’s surah was a fairly good one for communicating the good and sense in Islam. It would have sat much better with me if it had been the second surah, rather than the seventeenth. But al-Baqarah, al-‘Anam, and at-Tawba have built a foundation of unease that this only contributes to, and I cannot help but read this surah in light of that established unease. I am going to set out on a review of the Quran up to this point and try to collect what scriptures build up this message. My particular goal is to look for any redeeming qualities or purposes attributed the unbelievers or rejectors of the Quran/Muhammad. We are just shy of halfway through the Quran right now, and I’d like to capture how I’m feeling about it at this point. It’ll take a while for me to reread the whole thing and collate my findings, but I’ll try and have some material posted regularly in the meantime. I don’t know if any of my Muslim friends are reading this for me. If so, please extend your mercy and understanding to me, and thank you for following me through this. I should’ve put this among the moral commandments of last week, but as I didn’t and as most of you have already finished that post (thanks! ), I’ll put it here. We have more ayat concerning when to pray. Ayat 78-79 say to establish prayer from noon to sunset, and to recite at the dawn. It does not specify how long or often and could just be a range of time in which prayer must happen. By modern tradition there are three prayers from noon to dusk: noon, mid-eve, pre-sunset. You’ll also catch that there’s a prayer at night time, but the wording suggests this one is optional. God witnesses and counts it as credit. There’s some ambiguity as to the phrase “qur’an of the dawn.” Remember that qur’an/Quran is really just the Arabic word for the noun “recitation/reading,” so these ayat are definitely meaning a recitation/reading at the dawn. Does this recitation mean the Quran specifically? Probably, but I wonder if it also could refer to a formulaic prayer. How much Quran is recited in Muslims prayer? Prayer is such a central tenant and practice to their faith, I’m a little surprised at how little I know about it still. It’s something that I need to explore.